From the Infantry Officers Candidate School, 2nd Lieutenant Henry G. Phillips, now known as “Red” Phillips, joined the 47th Infantry Regiment at Fort Bragg, North Carolina in August 1942, where he was assigned to “M” Company. He participated in the Regiment’s amphibious assault on Safi, Morocco a few months later and after that was wounded at El Guettar, Tunisia while leading a machine gun platoon. He subsequently served as company executive officer and commander, and a Battalion staff officer, participating in the Sicilian, French and German campaigns of the 9th Infantry Division. 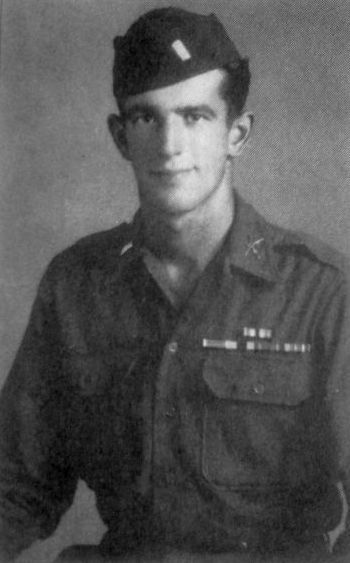 He was wounded again in Belgium and Germany and was twice awarded the Silver Star Medal for gallantry in action. He was also awarded the French Legion of Honor Medal for his service in France during World War 2. Red Phillips was commissioned in the Regular U.S. Army following World War 2, retiring in 1967 as a Lieutenant Colonel. His postwar decorations include the Legion of Merit and the Army Commendation Medal with Oak Leaf Cluster. In the course of his service he graduated from the University of Maryland (BS) and Illinois (MS) and the Army Command and General Staff College. After Army retirement he was employed on the faculty of PMC Colleges (Widener University) at Chester, Pennsylvania, and later moved to Lake Wildwood in California where for ten years he published and edited his community’s newspaper. Lt. Colonel Phillips is a Fellow of the Inter-University Seminar on the Armed Forces and Society and a Distinguished Member of the 47th Infantry Regiment. Henry was married to his wife for nearly 68 years when she passed away in 2010. He was also father of two daughters. Red Phillips wrote several books about the 9th Infantry Division. He is the author of Heavy Weapons, a chronology about the World War 2 adventures of his Company, El Guettar: Crucible of Leadership , an oral history of the 9th Division’s first encounter with German Army in North Africa, Sedjenane: The Pay-off Battle, about the 9th Infantry Division’s actions against the German and Italian forces in Africa, Remagen: Springboard to Victory, about the 9th Infantry Division’s fight to keep and widen the bridgehead near Remagen in Germany, and the book The making of a professional: Manton S. Eddy, an examination of the life of 9th Infantry Division General Manton S. Eddy. Red Phillips also was the “Official 9th Infantry Division Historian” and the former president of the Ninth Infantry Division Association. Red Phillips also was named the “Official 9th Infantry Division Historian” and the former president of the Ninth Infantry Division Association. A few of the books about the 9th Infantry Division that Henry Phillips wrote. Most of these are now out of print and hard to find. Early 2011 Mr. Phillips contacted me after he read a request for information that I posted in the Ninth Infantry Division Association’s newsletter. We exchanged several letters, and Mr. Phillips was very impressed by my research and dedication. He liked it so much, that he mailed me a couple of his books and told me they would surely help me in my research. This is something I will never forget. He was very supportive of my research. I was helping him to certain information in regards to the Hurtgen Forest battle as well. One week after I wrote him my last letter, I got the sad news about his passing. Lt. Colonel Phillips passed away on August 19th 2011, but will never be forgotten.